What role does artistic practice play today when Utopia seems a thing of the past? During the early years of the Cold War, the Socialist Federal Republic of Yugoslavia took an unexpected stand in relation to modern art. Artists and intellectuals embraced abstract art, while the country’s cultural policy also saw it as a possibility for educating the people and for social progress. Yugoslavia distanced itself from the Soviet Union’s condemnation of abstraction, yet was never totally behind the formalist ideas currently fashionable in North America. The Yugoslav context has contributed to later generations of artists questioning the basis of what has been called socialist modernity. Yet it also seems that the principle of utopia that nourished this project has never ceased to be recognised and is received as an inheritance with which to challenge the amnesiac state informing museums and the cultural neoliberal policies of today. 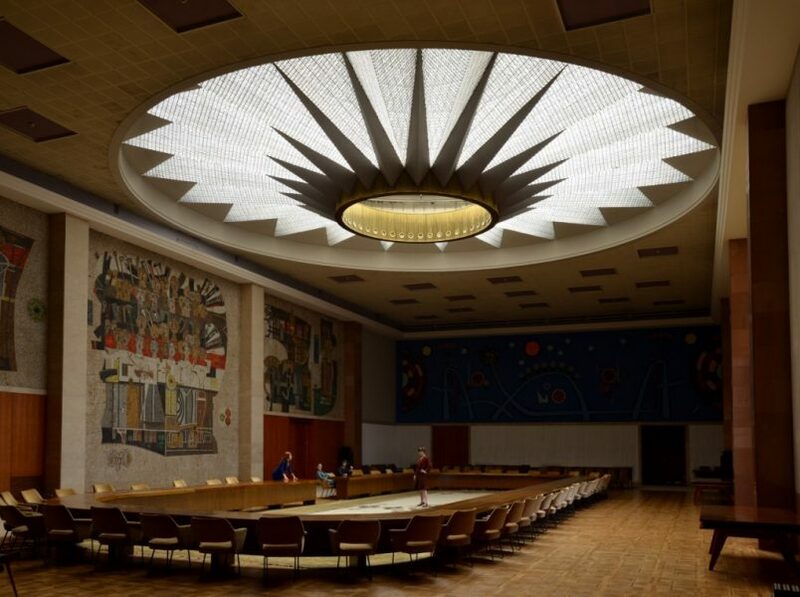 Abstract socialism is a programme of conferences and artistic projects on the current and past uses of modern art arising from the Socialist Federal Republic of Yugoslavia. It focuses on contemporary art practices that establish alliances with this legacy, albeit in a disruptive key, as well as historiographical accounts pointing to a critical review of the political and cultural initiatives that previously served to promote modern and progressive art. Featuring works by Jasmina Cibic, Søren Thilo Funder and Doplgenger. The Yugoslav Pavilion at the Barcelona International Exposition (1929), the first Croatian work of abstract art (Pafama, 1922), the Palace of the Federation in Belgrade (1961) and some reels of Radio Television Novi Sad from the 1950s, all come to life in the hands of Jasmina Cibic, Søren Thilo Funder and Doplgenger. More than strict historical research, these videos revisit controversial cases that occurred in the Yugoslav context of the interwar years and the Cold War through a process of appropriation, deviation and even deliberate fictionalisation. The aim is to address debates that relate to cultural policies rather than art history: what are and were the uses of artistic practice in respect to politics? And, as for memory, to what extent is it useful to investigate the conditions that should have made possible certain utopias that were never realised? Jasmina Cibic is a visual artist living between London and Ljubljana, whose work is based on the reinterpretation of Yugoslavia’s political and cultural legacy. Doplgenger is a collective formed by Isidora Ilić and Boško Prostran, two Belgrade artists whose work explores the regimes of visuality and reception of the moving image. Søren Thilo Funder is an artist from Copenhagen whose work explores the disruptive potential of nostalgia and counter-memory. Artistic intervention by Fokus Grupa in the Collection of the Fundació Antoni Tàpies. Stories about Frames is a (con)textual intervention within the current display of the Collection of the Fundació, Antoni Tàpies. Collection, 1955–65. Fokus Grupa has created a system of alternative labels that reference the years in which these works by Antoni Tàpies were created, raising links with the configuration of the contemporary art system during the years of the Cold War. In this sense, each work is viewed separately, although rather than revealing its particular physical properties, each new label refers to the material reality of the art world. Fokus Grupa is a collective from Rijeka, formed by Iva Kovač and Elvis Krstulović. They define their practice as interdisciplinary, seeing art as a material practice that needs to be addressed according to its legal, economic and social implications. With Andreja Hribernik, Ljiljana Kolešnik, Dalibor Martinis, Aleksandra Sekulić, Barbara Steiner and Ana Dević de What, How & for Whom/WHW. 5.00 p.m. — Welcome and presentation. Carles Guerra and Oriol Fontdevila. 5.45 p.m. — Ljiljana Kolešnik. 6.30 p.m. — Andreja Hribernik. Is there the possibility to think the institution of a museum as a space for utopia? 10.00 a.m. — Barbara Steiner. 10.45 a.m. — Ana Dević/WHW. Reactualizing the historical heritage from oblivion to the market…where are we now? 11.45 a.m. — Aleksandra Sekulić. 12.30 p.m. — Dalibor Martinis. With: Andeja Hribernik, Ana Dević/WHW, Aleksandra Sekulić and Dalibor Martinis. Moderation: Oriol Fontdevila. 1st Didactic Exhibition: Abstract Art, held in 1957 at City Gallery of Contemporary Art, was a response to numerous actual debates revolving around the legitimacy of abstraction and its position within the realm of Yugoslav socialist visual culture. Concerning the lack of information on key terms occurring in those debates, the exhibition brought together specialists in art, architecture and art history whose objective was to provide popular explanation of ab- straction. After the presentation in Zagreb, the exhibition was sent to a five-year journey through the Yugoslav museums and galleries where it was seen by more than 100,000 people. Such exceptional audience turnout could be explained by fortunate moment of the project realisation, which coincided with the gradual passage of abstraction into art mainstream, i.e. with cultural, political and historical circumstances surrounding the organization of the Didactic exhibition. Ljiljana Kolešnik is a Senior Research Fellow at the Institute of Art History in Zagreb, founder and Head of Regional Centre for Art, Culture and New Media. Her background is in art history, comparative literature and information science. Main fields of interest: post-war modern and visual culture, cultural translation in visual arts, historiography and methodology of art history. It is common that the appreciation of artworks and connected to this, notions of aesthetic quality and social relevance, change time and again. Not common is, however, a growing awareness that these changes also take place in the museum – thus replacing an older conception of the museum that represents objective, universal values. Since the 1960s, largely inspired by feminist and post-colonial discourses and institutional critique/criticality doubts have been raised about the museum ́s claim for the eternal, which in fact hides the interests imposed on it by dominant groups. In connection to these debates, and under particular consid- eration of the white cube, Barbara Steiner will talk about the collection show she did with Anna Lena von Helldorff at the Koroška galerija likovnih umetnosti in Slovenj Gradec in 2015/16. Barbara Steiner is curator, author and editor: since lectures as visiting professor for Cultures of the Curatorial at the Academy of Fine Arts Leipzig, where she co-runs the master-programme Cultures of the Curato- rial. In March 2016, Steiner was appointed director of the Kunsthaus Graz (Austria). Steiner studied art history and political science in Vienna. She wrote her doctoral thesis on The Ideology of the White Cube. The art museum in general is facing a challenge as an all-encompassing capitalist logic causes the homogenisation of space and time and erases the sense of otherness in the world. The talk will show the explicit case of a museum that was marked by the era of socialism and question whether this kind of past that still reflects on the museum today and whether it can be a potential for a space that offers resistance to the all encompassing commercialisation that is happening also in the field of art. There will be a special focus on the Koroška galerija likovnih umetnosti as an institution which was built on the utopian idea of a better world in the 60s and will show how the actualisation of these ideas can help us to think the future. Andreja Hribernik is director of the Koroška galerija likovnih umetnosti (since 2013). She graduated in Political Sciences at the University of Ljubljana and has been working in art museums since. Her research lies on the crossing of art and theory engaging with the topics of socialist heritage, utopia and the potential of a museum as an institution. The heritage of socialist modernism and conceptual art from former Yugoslavia has passed a long way from historical amnesia to a sought-after currency. In the last years we have been witnessing its resurrection at international exhibitions, in art and academic projects, on the market and in art collections. Whereas the questions of history certainly dominated these processes in both local and international context, they often privileged ‘memory’ over history or subtly depoliticized its content, while deliberating on the formal aspects. A complex attitude to history remains interwoven with the problematic attitude toward the communism, that in the local milieu has been recently aggravated with far-right revisionist vigour. The talk will be reflecting on several exhibitions and projects that from a non-academic position reactualized the status of this heritage and tried to propose its more politicized readings. How to rethink the notion of historical memory as a history that is constructive, antirevisionist, inherently utopian and radically open to the future? What, How & for Whom/WHW is a curatorial collective formed in 1999 and based in Zagreb and Berlin. Its members are Ivet Ćurlin, Ana Dević, Nataša Ilić and Sabina Sabolović, and designer and publicist Dejan Kršić. WHW organizes a range of production, exhibition and publishing projects and directs Gallery Nova in Zagreb. Since its first exhibition titled What, How & for Whom, on the occasion of 152nd anniversary of the Communist Manifesto, that took place in Zagreb in 2000, WHW curated numerous international projects. The period of destruction of Yugoslavia and later transformations of post-Yugoslav countries brought one common imperative: oblivion of the emancipatory politics, public good, social and economical mechanisms developed in self-governed socialism in Yugoslavia. Whether it was induced by infamation of ‘communist regime’– historical revisionism built on focus on the ‘crimes of communists’ as the allowed memory of Yugoslavia, or the overwhealming commodification and consumption of particular fragments of its history and culture, the oblivion was built to prevent continuity with its fundamental ideas. Field of culture was used for challenging that imperative in various formats, drawing up some of the models of joint production, political emancipation of students, radical amateurism, youth and alternative culture in propulsive media and artistic system. Aleksandra Sekulić is PhD candidate in Theory of Art and Media, University of Arts, Belgrade. MA in Cultural Policy in the Balkans, UNESCO Chair, Belgrade – Lyon 2. BA General Literature and Theory of Literature. Film and art program director in Center for Cultural Decontamination. In the period 2005-2008 program manager of Academic Film Center, DKSG Belgrade. Data Recovery work series deals with the issue of social (and personal) memory or to be more precise the loss of that memory. We know that a person needs forgetting in order to avoid constant pressure of trauma, but socitey on the other hand needs memory in order to avoid doing the same mistakes. As with the loss of data in the computer disk which is sometimes possible to retrieve only fragmentarily and dispersed outside the original files, the procedure of Data Recovery is an attempt to recover pieces of action, events or situations which are lost in our general memory-loss. The important thing is not contextualize such event through interpretation, historicizing and manipulation of the lost meaning. Instead of the description which places the content in the historical time and place we want to generate what Wallace Stevens defined as the “phenomenon without the context which completely conforms to the real event” . Dalibor Martinis was born in Zagreb in 1947. Graduated from the Academy of Fine Arts in Zagreb; has exhibited since 1969, and works as a video artist. He has had numerous personal shows, performances and video screenings, and participated in many international exhibitions (Biennales: Sao Paolo, Venice, Kwang-ju, Thessaloniki, Cetinje, Cairo, Ljubljana; Dokumenta/Kassel, and so on). 4 May 2016 / 6.00 p.m.
4 May 2016 / 6.30 p.m.
11 and 18 May 2016 / 5.30 p.m.
13 May 2016 / 5.00 p.m.
14 May 2016 / 10.00 a.m.
With Andreja Hribernik, Ljiljana Kolešnik, Dalibor Martinis, Aleksandra Sekulić, Barbara Steiner and Ana Dević from What, How & for Whom/WHW.